As his final act of charity he donated his eyes so someone can see better but the truth is that he has inspired thousands and they can look at the world in a very different way. For me that is his legacy, Edhi Sahab becoming a giver of inner sight and a constant call for our conscience. The banks of Neelum River, surrounded by the mountains of Kashmir Valley, may seem like an incongruous place to mourn Abdul Sattar Edhi – but I had little choice. That is where I received the news of his demise thanks to a lady who, after finding out that I am from Karachi, immediately asked me if I was going to his funeral. Shocked, I retired to a lonely spot and then the location didn’t seem so strange after all. Like the eternally flowing waters and high mountains Edhi Sahab was inspiring. His life, like these living natural monuments was gigantic, deep and lofty; the vastness of which rendered other beings insignificant and impossibly small. Staring at the gurgling river, I started thinking about the man who had exemplified the spirit of philanthropy and been the conscience of an entire nation. It’s almost superfluous to write about Edhi Sahab’s achievements. The story of how he (almost single-handedly) created one of the largest charitable organisations in the world is well documented. He had a direct impact on the hundreds of thousands of destitute and abandoned Pakistanis; the refuse of society. Thanks to him, those who were alive were taken care of as well as those who were dead – regardless of caste, creed and race. In a country divided along these lines, the message of a common humanity alone warrants him all the accolades and Emma Lazarus’ could have written these lines for Edhi Sahab. Edhi Sahab’s tangible contributions are enormous; the ambulance service, orphanages, homes for poor, elderly care, international humanitarian work, etc. But what cannot be overemphasised is the sense of pride and inspiration he gave to a world shorn of icons. The coups and killings, corruption and injustice, state and non-state terrorism, venal politicians and general lawlessness combine to give a sordid view of the world around us. While every era has had these problems, previous generations had the figures who countered the pessimism and made them feel better about themselves. Take a look around, you will see the cupboard quite bare of personalities that you can unabashedly love or look at to restore your faith in humanity. In all this gloom he did it and made us feel better. He’s been called a living saint but he wasn’t a saint that retires into seclusion and only prays for his followers’ souls. No, he saved their lives and did his best to compensate for the state’s failure to take care of its citizens. There are hundreds of stories about him that exemplify this ‘compensation’. One of them was narrated by a former commissioner of Karachi who said that when floods hit Karachi, he went to oversee relief efforts and came to the affected area’s police station. There he saw the police personnel wielding long bamboo poles. Upon asking, the SHO replied that they use the poles to move the dead bodies floating in the water away from the police station so they wouldn’t have to bother with them. Eventually a call was made to Edhi Sahab who quickly turned up with a team and gave the fetid, bloated bodies a proper burial. It’s a typical Edhi story: one man standing between disaster and relief. As I watched the darkening sky, I bitterly regretted not being able to visit him at the hospital. He wasn’t allowed visitors and I don’t blame the Edhi Centre or the hospital staff for discouraging me. However, years back I did get a chance to meet him at a very different setting than what he was normally used to. 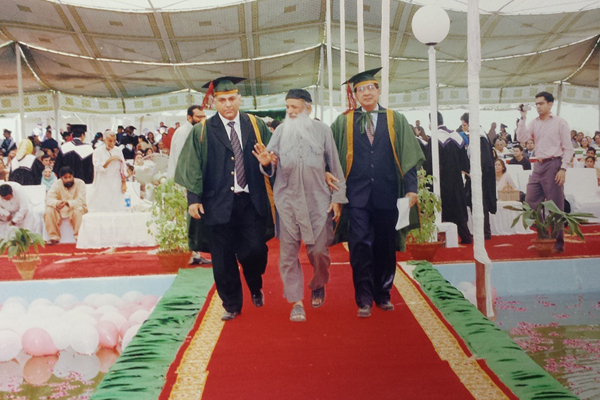 It was the convocation of the Institute of Business Administration (IBA) and Edhi Sahab was to be presented a honourary doctorate degree. On November 11, 2006, at the appointed hour, he arrived in a battered van and as he got out there was spontaneous applause to mark his entry. 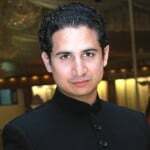 He was addressed in the attire we identify him with, a very well-worn grey shalwar kameez, clean but slightly patched and the shirt slightly higher than it should be. Dark slippers and the fraying Jinnah cap that marked his connection with the country’s founder. He stood in sharp contrast amidst the sea of students in formal clothes and the starched dignitaries, but that only added to his image of a saint who was above worldly possessions and finery. Beaming with a quiet pride, he was led to the stage and dressed in the green gown of dons and professors. 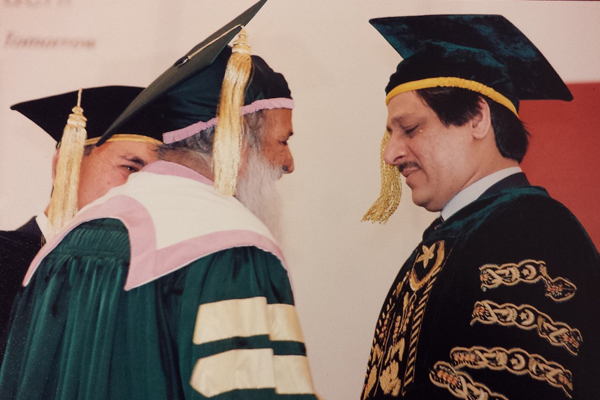 The Jinnah cap was replaced by the graduates’ mortarboard and never has it crowned a more worthy man. It suited him too and if the real purpose of education is reflection, service for mankind, thoughtful self-cultivation, respect and ethical and moral excellence then Edhi was more educated than all the professors and heads of department who were assembled around him. 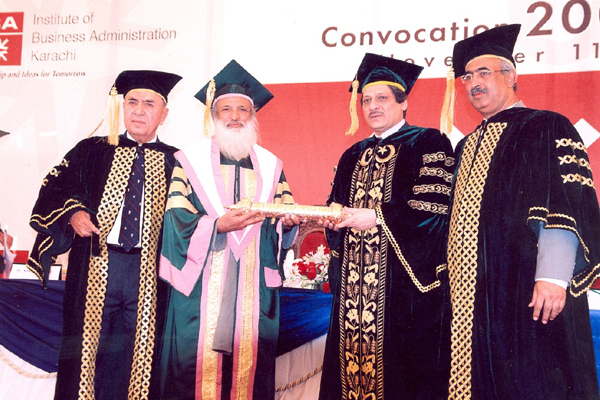 As the Governor of Sindh and Chancellor of IBA, Dr Ishratul Ebad Khan handed him the degree, we all erupted in cheers. Convocations tend to be rather staid affairs but this one had the lustre of Edhi Sahab and how we celebrated his presence. From the podium he extolled us to right the wrongs, help the destitute and help those who are worse off. I can still remember his words. After the ceremony he was taken to the roped-off area earmarked for dignitaries but wanted to have tea with us, the regular students and staff. Many of us tried to hold his hands or somehow get close. It was as if his touch could heal us and solve problems through their natural power and energy. We were in the presence of greatness, someone who embodies the values of faith and basic humanity. 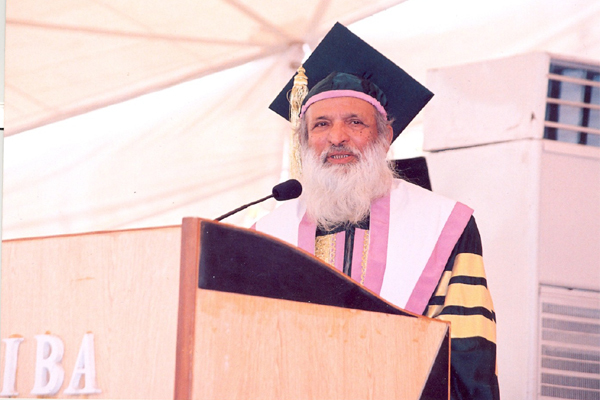 Honourary degrees raise the prestige of the person receiving them but, by accepting it, Edhi Sahab had actually bestowed honour on IBA and the same can be said for his other awards. Was he really a saint? While his touch did not restore sight – through his deeds, he did cure the blindness from many eyes; the blindness that renders those suffering invisible and makes us look past the evils of the world. That blindness is much more damaging and is more difficult to cure. As his final act of charity, he donated his eyes so that someone else can see better. But the truth is that he has inspired thousands and they can look at the world in a very different way. For me that is his legacy, Edhi Sahab; a giver of inner sight and a constant call for our conscience.